The month of October is covered in pink ribbons. You want to support the cause, raise awareness, and make a difference. But where do you begin? How do you know what to promote? What is appropriate? What is off-limits? What charities should you support? How do you support the cause without “pinkwashing”? Whether you have engaged in breast cancer awareness campaigns in the past, or if this is your first time, you still want to do it right. You want to make a difference and not just provide lip service to the movement. 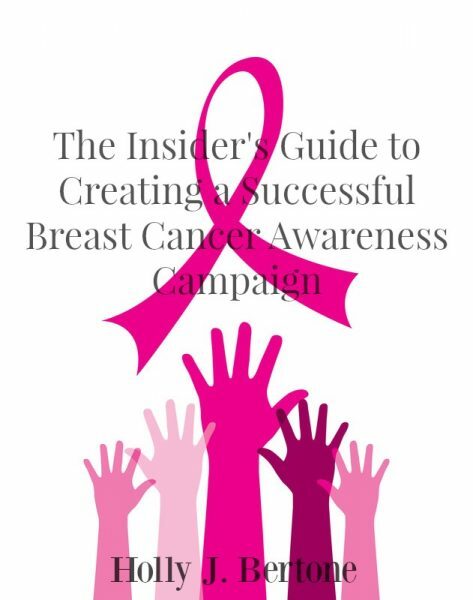 Holly Bertone used her Project Management Professional training to create a quick and easy guide to walk you step-by-step through the actions you need to take to create and implement a successful breast cancer awareness campaign. Printable worksheets are included to help you stay organized throughout the process. Whether you are a small or medium size company, a brick and mortar company, or a website or blog, the concepts provided in this book are universal.